Last week I stopped at a Whole Foods in West Los Angeles to pick up a few things for dinner on my way home from work. I always eye the dessert case to see what’s new in case something catches my interest. 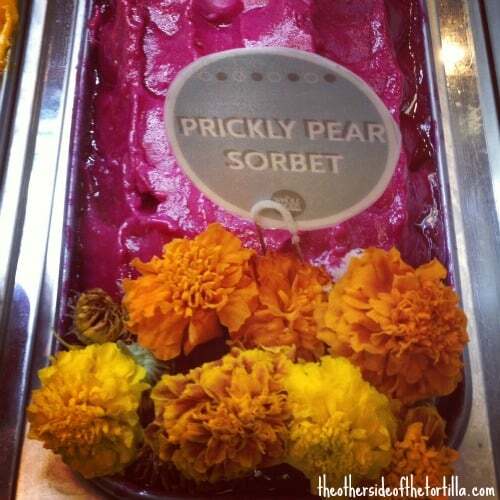 I was delighted, then, to see this red prickly pear sorbet! I didn’t have time to stop that day to get some because I was in a hurry, but I went back a few days later. The man at the counter who helped me asked if I had tried prickly pears before, which launched us into a conversation about Mexico and him telling me about a cheesecake recipe he makes, dedicated to his mother who loved prickly pears, that has prickly pears (known as “tunas” in Spanish) layered in it. I’ve got to go back again soon to ask him where I can get one or if he’ll share the recipe with me. Anyhow, I ate the sorbet that night for dessert. Suffice it to say that I’m already working on developing my own recipe to share with you as soon as prickly pear season starts. I love cactus fruits and have been making agua fresca with them for a long time. Here’s a video I made in 2010 for The Other Side of The Tortilla that has a little more information about prickly pears (tunas) and my agua fresca recipe for agua de tuna roja. My friend Vianney over at Sweet Life also has a great red prickly pear margarita recipe that you should check out! Do you have a favorite way to eat prickly pears? Let me know in the comments! Hi Maura. Looks great. I have tunas out back and have tried the agua frescas. I don’t put sugar in mine either. The seeds I haven’t heard of but am will to try healthy foods, etc. Thanks.